The top legislator expressed her concern over the fact that most cancer patients, over 70 percent, do not come in for treatment until the later stages of the disease. There are a great number of cancer patients, especially those without health insurance cards, in need of urgent help, Ngan said. She added that for those children with cancer who do look to undergo treatment in the long run, many come from disadvantaged backgrounds and families that cannot afford the costs. As such, many health workers have donated their money to help support their patients, Ngan said. The NA Chairwoman hailed the hospital’s Supportive Fund for Cancer Patients – Bright Future, which has been used effectively over the past seven years. 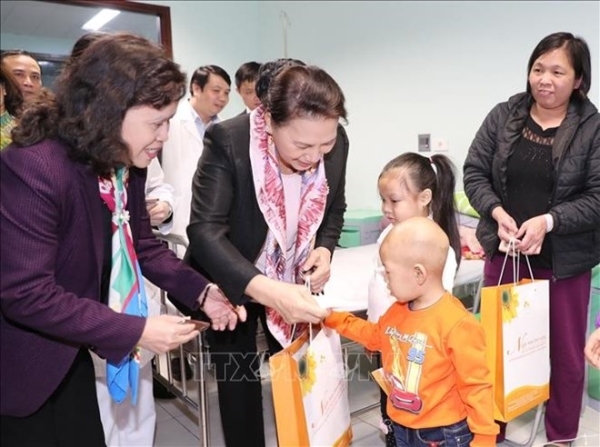 Through the fund, the hospital has supported treatment and presented gifts worth over 24 billion VND (one million USD) for more than 24,000 disadvantaged cancer patients across the country. The fund provides medicine for cancer patients at a total cost of over 400 billion VND (17.2 million USD). In 2018 alone, the hospital provided medical checkups for more than 1 million child patients and treated almost 100,000 child inpatients. Last year, Vietnam reported around 164,000 new cancer cases nationwide, 1.5 percent of which are children, and 114,000 resulting in death. On this occasion, 100 child cancer patients undergoing treatment at the hospital were presented with a gift package and 1 million VND each, sponsored by the Supportive Fund for Cancer Patients – Bright Future.